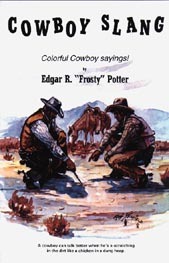 Lingo of the American West captured in 2,000 phrases and expressions - colorful, humorous, fun! Horse and cattle terms, rodeo talk, barbwire names, brands. Illustrated by Ron Scofield. By Edgar ""Frosty"" Potter.